Have a SonicWall competitor product? Take advantage of the competitive takeout promotion and get your SonicWall hardware for free, when purchasing 3 years of SonicWall Advanced Gateway Security Suite. With the Advanced Gateway Security Suite you'll gain the latest in next-generation firewall technology and access to the SonicWall Capture ATP service - a cloud-based, multi-engine sandbox that stops both known and unknown cyber attacks from impacting your business. See below for the eligible competitor products included in this promotion. Take advantage of SonicWall's 3 & Free upgrade promotion. 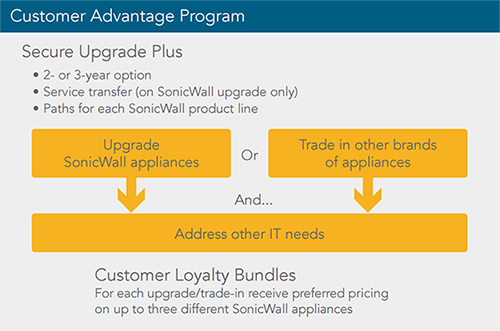 When upgrading from an old SonicWall product and purchasing 3 years of the Advanced Gateway Security Suite you can get your new SonicWall hardware for free! See below for eligible and replacement SonicWall products included in this promotion. Take advantage of SonicWall's ongoing promotion. SonicWall's Secure Upgrade is a simple promotion available to anyone moving from a previous SonicWall or a competitor's appliance to a product from the latest generation. Existing customers can protect their investment by moving licenses and services from their existing appliance, while customers who are new to SonicWall gain discounted subscriptions across almost all product range. If you own an old SonicWall you can move to a latest generation device with a Standard or Advanced Security Suite, claiming your free and discounted services, any existing licenses will move from your old box. If you have a competitors device (talk to us about what is valid) you can move to SonicWall and get a new unit with 2 years of Standard or Advanced Security Suite, for the price of one! Register with information on what you are moving from and claim your extended services. Call us if you need any advice on what unit would be best for you of if you have any technical questions about your deployment. If you're ordering through our website you'll find the Secure Upgrade appliances listed in the unit options and further details on which unit is best for you, plus more about this promotion, can be found in the datasheet here.